I’ve got a small etching press that I haven’t used for any serious work. I don’t know much about them. Why do some of these presses have rubber covered top rollers and others with plain steel? The etching press I have that has a rubber covered roller was set up to proof type. It even came with a chase bolted to the press bed. 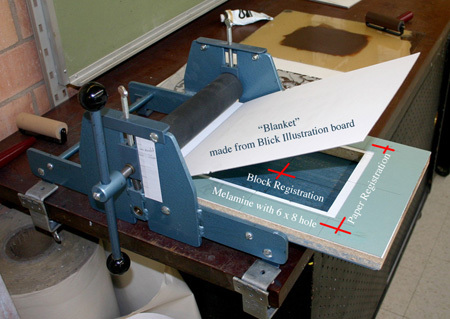 Even when printing etchings, the etching presses use a felt “blanket” to allow the paper to push down into the grooves of the etched lines. The rubber coated roller may serve as a blanket of sorts. I have only seen this on low quality presses. Rubber rollers are not offered on any well known brand of etching press that I am aware of. It will still work, but probably not with the consistency one would expect from a press. I now use my rubber roller as the bottom roller. This press is the press that students use to print linocuts. Thank you. I hope I’m not breaching protocol on here by mentioning etching presses since this is a letterpress site. But I appreciate your response. Yea, it is a small hobby type press, but fun to play with. I guessed the rubber roller was for relief printing rather than intaglio. Did you just swap the top and bottom rollers? Also, the diameter of the steel core on the top roller is the same as the bottom roller. It appears that they just added the rubber cover to it. Can I just remove the rubber and print intaglio with it? It’s small but fairly sturdy and looks like it would stand the pressure. Here is a pic of my student etching press. We call it the ghetto press.